In the Waldorf, Montessori, and Reggio Emilia approach, only the best art supplies for kids are used. High-quality children’s art materials are said to educate the senses and condition the young child’s mind for higher learning. It’s not the quantity, but the quality of the art materials for kids that matters. Your child does not need to be a Waldorf or Montessori student to have a high-quality art education. These art supplies are for every home that wants the best art education for their child, whether you homeschool or not. Quality art materials are beneficial to children in many ways. Giving your child the best art supplies sends them several positive messages. It tells the young artist that their artwork is worth it. They are good enough for the best. Feeling worthy of the best art supplies can help motivate a child to create art. High-quality art materials also give your children the opportunity to learn to be responsible for them. Teach children with your words, and your example of how to properly care for art supplies. When we use quality art materials and treat them with care, our children will as well. When children use the best art supplies they often learn to work slower and have a bit more care for the supplies they use and the art that they create. This opens the space for a child to develop reverence. As a result, children will learn to enjoy art and learn that art is about the process of creating art, not the final product. Why are These Children’s Art Materials The Best Art Supplies for Kids? The colors used in Waldorf art supplies are selected based on Goethe’s “Theory of Colors.” Each color is based on the natural gradations found in Goethe’s twelve-part color wheel. It is believed that these natural tones stimulate the senses and encourage creativity. Rudolf Steiner believed that children need these top-notch supplies to fully develop their creativity, color awareness, and appreciation for process art. Some of these supplies come with higher price tags than lesser quality ingredients, but they will last much longer. The good news is you don’t need to purchase the whole art store. Less is more… Less allows your child’s creativity to bloom and your wallet to sigh with relief. Just a few high-quality supplies are all you will ever need. Below you will find the best basic art supplies used and recommended by Waldorf schools around the world. They make great gift ideas and wonderful stocking stuffers for children of all ages. Once you use a real beeswax crayon you will never turn back. The smooth consistency and vibrant colors will make ordinary crayons pale in comparison. Beeswax crayons allow your child to create effects that are not possible with regular crayons. The transparency of the colors will give your child the ability to create a wide range of intermediary tones when layered. They are also safe for the environment, and harmless to your child’s health if you constantly find your child sucking and biting on crayons like I do. It’s not easy being a mom, is it? Knowing that the crayon that my daughter has in her hand is safe for consumption helps me sleep a bit better at night. Stockmar Beeswax Crayons come in two basic types–block and stick. The color assortment contained in THIS selection was developed by Lyra in cooperation with the renowned Waldorf School. Each set includes an exclusive selection of unlacquered Super Ferby Pencils, which feature a large triangular shape and a comfortable grip which is perfect for beginners and left-handed people. The pencils have a closed end (so the core is not exposed) with natural, unlacquered wood for young children who like to chew and put pencils in their mouths like mine. P.S. If you have a child that likes to chew on everything and drives you as nuts as mine drives me, try a chewing necklace. A strange product… but a true gift for my sanity and my daughter’s well-being. Modeling beeswax is an ideal material for young developing hands. Each sheet can be cut, kneaded, and used to make little sculptures. Working with modeling beeswax is a great way to develop the fine motor muscles in the hand to prepare for writing and more detailed handwork like sewing. The best part about these beeswax modeling sheets is that they can be reused again and again! Beeswax softens with warm hands or water and will stiffen again when not in use. Modeling with natural beeswax stimulates the desire to invent and leads to higher learning. Waldorf educators consider it an indispensable teaching aid for encouraging the development of creativity and awakening the artistic imagination of children. In the Waldorf tradition, children learn to paint with only the primary colors because all colors can be created using them. Painting with only the primary colors allows children to experience and understand color on a deeper level. This is another reason why only the best art supplies are used in Waldorf education. If you would like to learn how to teach your child the wet-on-wet watercolor technique used in Waldorf Schools click on the link. To see a wet-on-wet watercolor experiment we did with Stockmar watercolors vs. liquid watercolors hop over to read three color wet-on-wet watercolor painting. Alternatively, you can purchase a complete watercolor paint set for one child. This awesome starter set includes a 3 color watercolor paint set, 1-inch flat wash watercolor brush, paper, paint board, sponge, and glass jars with a holder. For more information about using watercolors and sharing how to use them with children check out Wet-On-Wet Watercolor Painting for Kids. We also recommend Painting and Drawing in Waldorf Schools and/or Painting in Waldorf Education , and Educating Through Art . You don’t need to be a student of Waldorf education to want the very best art education for your child. The high-quality Waldorf art supplies listed above will provide years of use for your child! Okay, okay, I admit it. My family is made up of a slew of art and craft junkies, so we have a lot more art supplies than we have listed above. I have updated this post at the request of some of my regular readers to included a few more of our favorite most used art materials in our home and on this website. 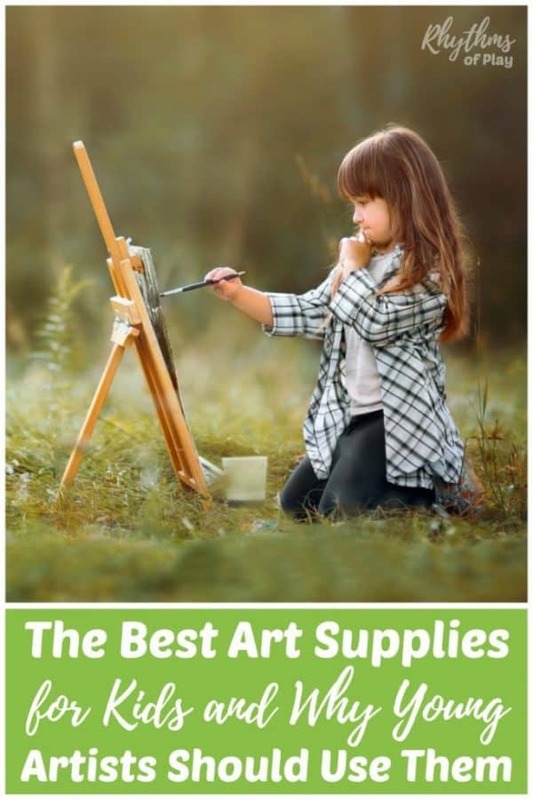 The suggestions below are for the art enthusiasts out there that like to have a few more options on hand, but you only need the supplies listed above to have a complete high-quality art set for your budding artist. Remember… less is more and quality matters more than quantity. Not everything we use for crafts and STEAM projects can be found in the art supply lists for toddlers, preschoolers, kids, teens, and adults below. There was not enough room to list every material including the kitchen sink–ours could be considered action process art on most days-lol! I have separated the art supplies below into recommended age groups to make it easy to find the type of art supplies that will work best for children of different ages. 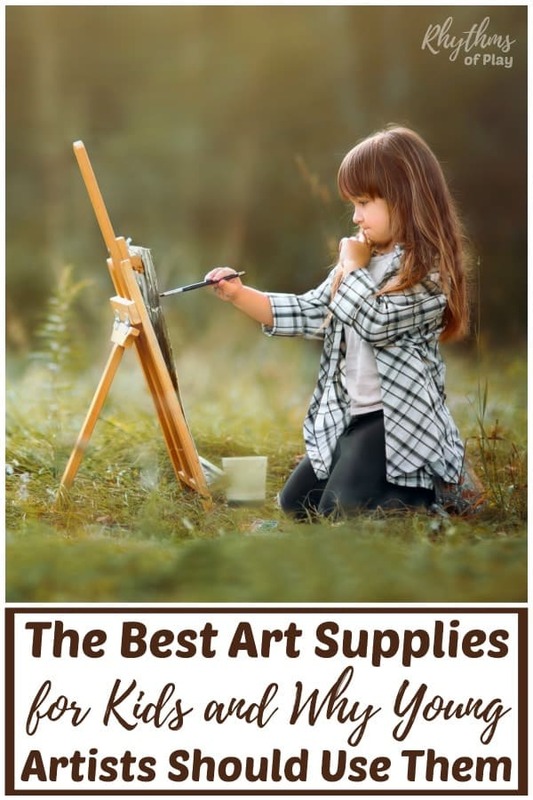 The first list contains more of the best art materials that are perfect for both age groups listed below, while the next two lists provide the best art supplies for specific age groups. 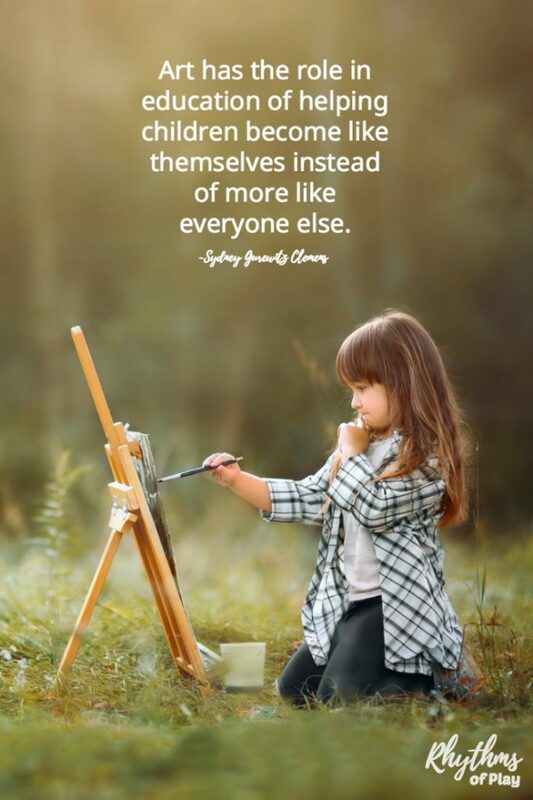 Allowing our children to use the best art supplies will educate the senses, help the child feel worthy, and condition the young child’s mind for higher learning. Be sure to have a look at all of our Art and craft ideas for kids. You may also like DIY Projects for Do it Yourself Families. Click HERE to learn more about Rhythms of Play! Thanks so much for sharing all of these different art supplies for kids! I had no clue that beeswax crayons even existed! However, those block crayons look really cool; I definitely think my kids would like those! Hopefully getting them some cool art supplies will get them more interested in art as well! You’re welcome! I’m so glad you appreciate finding these supplies. Beeswax crayon’s really are wonderful! Amazing! Really helpful to inspire kids creative work. Art can increase kids mental growth and creativity. So it is essential to provide best art supply to inspire kids creative work. Thanks for such a nice blog. Thanks, Marria! I agree the best art supplies can inspire children and increase their creativity! You are welcome, Betty! 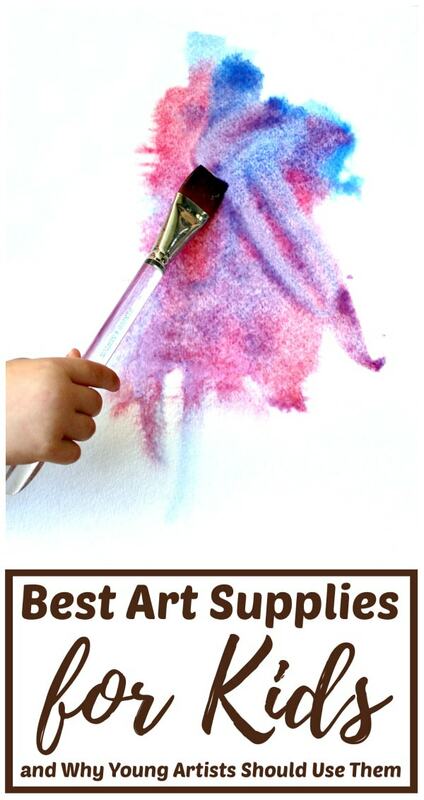 So glad you like this list of the best art supplies for kids. I LOVE that quote as well! !